Decision: Should You Play Shardgale? Orcs and Fiends almost certainly should. Farstriders and Reavers may want to try it out in specific decks. Everyone else is likely better off playing something else. Shardgale is perhaps one of the most controversial cards in the Shadespire meta. 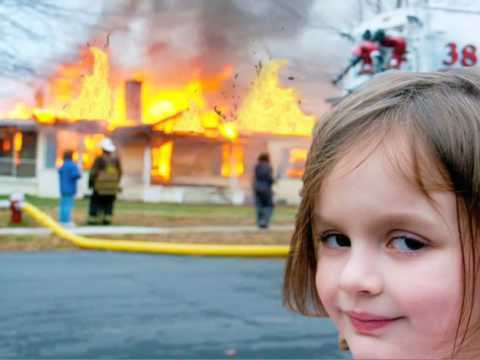 It's high risk, high reward effect all but insists on an all-out aggro playstyle that had largely fallen by the wayside prior to the release of Mollog's Mob. However, with the big fella reigniting players' desire to smash indiscriminately, Shardgale may once again be entering the meta in a big way. If, that is, you're playing the right kind of deck. Simply put, if you're playing anything other than aggro, Shardgale probably doesn't belong in your deck. There's virtually no benefit to be had from including it in a defensive deck - in fact, Shardgale will likely mess up some of your objectives, something we'll talk about more later. Similarly, Hold-Objective style decks might occasionally benefit from using Shardgale, but the potential of knocking out one of your own objective-holders is probably too great to justify including it. Finally, some hybrid/midgame decks may want to consider Shardgale, but with the delicate timing required of these kinds of decks, there are probably better options (see the "alternate path" section below). 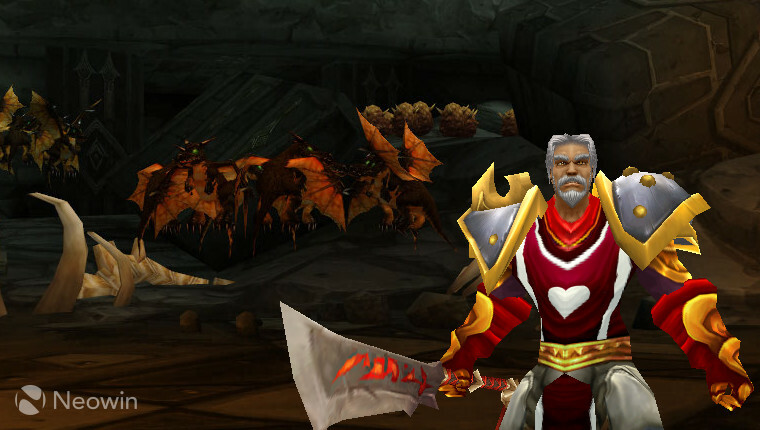 Several warbands reap additional benefits from using Shardgale, but we'll look at those benefits. in the next section. To begin with, let's look at the base statistical values that should directly inform your use of Shardgale: number of models and number of wounds. *This warband's differential wound scores have been averaged for simplicity. For maximum confusion, high numbers in the above chart are good. In general, high wound/low model-count warbands will benefit more from playing Shardgale than low wound/high model-count warbands. Viewed purely in terms of wounds, the Orcs gain the most benefit on average from playing Shardgale while Eyes of the Nine suffer the most. The Sigmar warbands all get good use out of Shardgale, as do Dwarves. Mathematically, Gitz, Eyes, and Godsworn should probably avoid it. But the warband-based benefits of playing Shardgale don't end there. A couple of warbands do gain specific benefits beyond damage from playing Shardgale. First, and most obviously, Orcs inspire when they take damage. This is probably where the most controversy over Shardgale comes into play: is it worth it to inspire your Orcs at the cost of one damage? The following table summarizes how much average damage each Orc will gain on an unblocked attack if they are inspired. 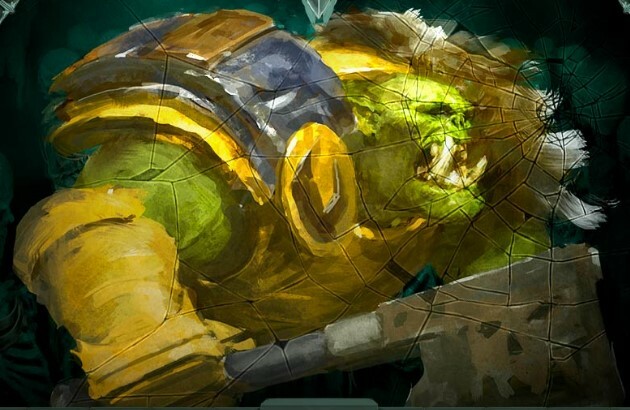 If you are going to use Shardgale to inspire your Orcs, you might consider waiting until Gurzag eats dirt, as he gains the least improvement from inspiration. Basha and Hakka gain the most from inspiration, almost tripling their average damage output! When you eventually end up with Gurzag and Bonekutta pushing daisies (and you will, because Orcs are underpowered), Shardgale may help to bring Basha and Hakka up to par with comparable dangle-bros from Magore's Fiends. Speaking of Magore's Fiends, Rivers of Blood is almost a reason to play Shardgale in and of itself. It's generally a bad idea to include an objective that you can only score through the use of a particular power card, but having an objective that works well with your warband and is easily triggerable through the use of a power card is a solid choice. While other warbands do have access to cards like Blooded and Scent of Victory, the fact that Rivers scores two glory places it head and shoulders above the other choices. The lesser of the two Chaos armies can also benefit from Shardgale, as it can be used to help them inspire by filling the graveyards with corpses of both friend and foe. However, since the Reavers risk losing more than they gain from Shardgale, this probably isn't the best use for it. In terms of universal cards, My Turn probably represents the strongest potential for combos with Shardgale. Being able to trigger My Turn whenever you want to is a strong play, and combining it with the extra damage from Shardgale means that your My Turn attack will almost always have the potential to take out your target. Cards like Reflected Injury and Sadistic Strike gain similar benefits from Shardgale, but likely don't see enough regular play to justify taking up a power slot. Objective cards that reward you for your warband taking out enemy fighters, rather than your fighters taking them out, can also be triggered by Shardgale. Arm's Length, Defensive Strike, and Offensive Strike all fall into this category. If you're lucky, a well timed Shardgale can help you score Alone in the Darkness or similar objectives (As Nagash Commands, etc) as well. In a pinch, you can even use Shardgale to kill your own models in order to trigger effects like Pure Carnage or Conquest. On the other end of the spectrum, Shardgale can be used to severely disrupt some of the best strategies for Defensive decks. Cards like Brave but Cautious, Sigmar's Bulwark, and Bloodless can all be denied through the use of Shardgale. As Shardgale doesn't require a roll and doesn't have a range, limitation this tactic can even be used when a defensive deck successfully uses its tricks to prevent you from attacking its models (usually in the first round). Similarly, Complete Victory (and its warband-specific twins 'Ard as Iron, Oaths Still to Fulfil, and Eternals) can also be spoiled by Shardgale - though you'll also need to put in some other work to kill an enemy model or two. If your enemy has models on the table that are at one wound, Shardgale can even help you prevent positioning based objectives like Well Guarded and Supremacy. Finally, in perhaps its most under-used capacity, Shardgale can be used to deny your enemy objectives that require a minimum number of models on the table like Dark Rewards, No Heroes, or even Blooded/Scent of Victory. Trap, Pit Trap, and Twist the Knife are all restricted for good reason. Prior to the release of Nightvault ,they had become ubiquitous in all but the most defensive decks. Shardgale remains unrestricted, likely because the cost of damaging your own fighters is believed to weigh down its perceived usefulness. But Shardgale can perform (and sometimes out-perform) these restricted cards in many of the same ways (h/t to Justin at The Battlecast for inspiring this comparison). At its most basic level, Shardgale can be used to set-up/finish off enemy models for a kill in situations where the enemy would normally be too tough for you to take down. Similarly, it can be used to alter your enemy's wound count so as to ensure that you can score cards like Precise Strike or The Bigger They Are. 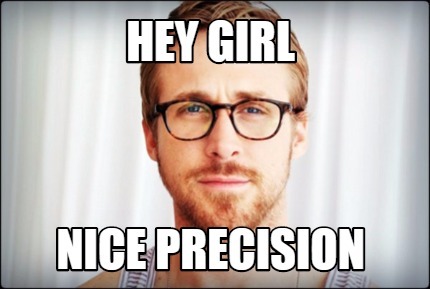 Essentially, it provides an extra level of precision to your warband when trying to deal specific amounts of damage. Therfore, it is warbands that depend upon precision and offer varying amounts of damage that benefit most from Shardgale in this sense. The immediate standout in this area is Farstriders. Farstriders already score well (ie. they have a low percentage) on the damage ratio chart at the beginning of this article. Furthermore, they all have a high-range/low-damage bolt pistol attack that greatly benefits from the added precision provided by Shardgale. For comparison, we can see that Mollog doesn't really gain a lot from Shardgale, as his attack is quite likely to kill the average target on a success regardless of whether or not they have been damaged already. On the flip side of this coin, it's worth considering whether Shardgale's damage really matters in terms of how easy your models are to take out of action. Gerblins, for example, take a lot of damage from Shardgale - but most of their fighters are 2 wounds anyway, and already die to the majority of the attacks in the game. Rats and Skeletons both have ways to bring back their dead, so losing a model or two to Shardgale probably isn't as big of a deal to them as it is to Cursebreakers or Fiends. Gurzag (and Mollog, for that matter) exists on the other end of this spectrum; most non-Mollog fighters won't be able to one-shot Gurzag at 5 wounds, but most non-Mollog fighters also won't be able to one-shot him at 4 wounds. There's no exact science to this particular calculation, but if you feel like your fighters die to every hit they take already, you don't risk as much by playing Shardgale as someone who goes from relatively tough to relatively fragile when they take a single wound (generally those with 3 or 4 base wounds). The main strength of Shardgale - and the reason it even warrants inclusion in decks - is that it is unrestricted by range, dice rolls, and targeting requirements. It simply does damage. 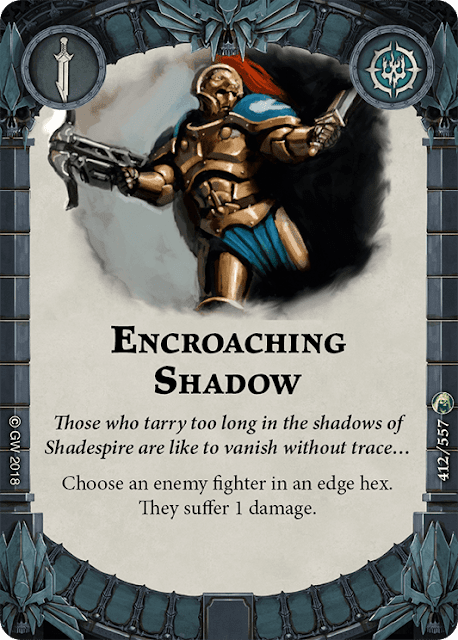 Encroaching Shadow fits two of those three criteria, and its targeting requirement is met frequently enough that it may serve as a better choice than Shardgale for some decks looking to do a little extra damage. Most importantly, Shadow doesn't deal any damage to your own models, so it's more appealing to those warbands that can't easily soak the damage from Shardgale. With the popularity of Hidden Paths (most of us who are paying attention anticipate it going on the restricted list soon), Encroaching Shadow becomes even better. The target of Hidden has to both start and end on an edge hex, and they gain a move token after its use, making it hard for them to get out of the danger zone (DANGER ZONE, LANA!). If your warband needs a ploy-based damage boost but can't spare a restricted slot for Trap or soak the self-inflicted harm from Shardgale, Encroaching Shadow may be the best choice for you. Of course, if you're playing Farstriders, you may want to take both. 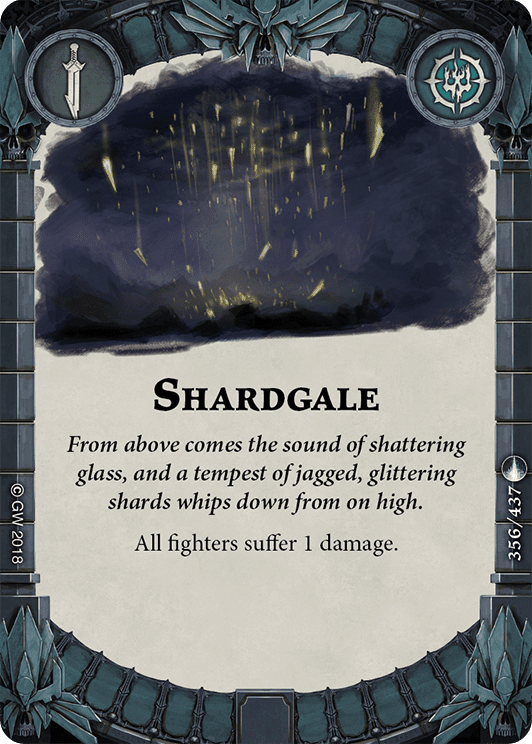 Shardgale provides something quite rare in Shadespire: universal, unmitigated damage. If that's your jam, you should try it out. Fiends, Orcs, and Farstriders are positioned especially well to take advantage of Shardgale, and it should really be considered for any aggro deck out of these three warbands. Outside of the chosen three, Shardgale likely won't benefit you as much, and you might want to consider other options instead.